Fully dramatized and produced with cinema-quality sound design and music, each title in Radio Theatre's Chronicles of Narnia is now available in a travel-friendly size. Hosted by Douglas Gresham, stepson of C. S. Lewis, these timeless classics have mesmerized millions around the world. Upon entering an enchanted world called Narnia, four ordinary children learn extraordinary lessons in courage, self-sacrifice, friendship, and honor. 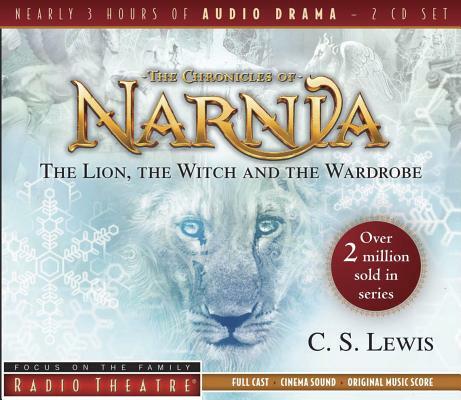 Brought to life in London by a cast of more than 100 actors, including award-winners Paul Scofield, David Suchet, and Ron Moody, the 7-part Chronicles of Narnia provides over 22 hours of exhilaring listening entertainment.The Lion, the Witch, and the Wardrobe: Four children in search of an adventure find themselves in the far-away land of Narnia—a world populated by talking animals, an evil White Witch, and a fearsome lion named Aslan. Over the years, countless millions have made the same journey, through C. S. Lewis' imaginative novel "The Lion, the Witch and the Wardrobe." Now that incredible story unfolds as never before in the audio dramatization of this immortal classic-from the Peabody Award-winning Focus on the Family Radio Theatre team. Featuring talented actors, film-style sound design, and a rich musical score, this thrilling tale reminds us of the greatness of God's sacrificial love.